The story goes that the Louis Sipp estate was founded at the end of World War I by, you guessed it, Louis Sipp. In fact, the real founder of the estate was his wife, Louise Sipp, who bought the estate’s first vineyards while her husband was still away on the Russian front. It was during this time that the fledgling estate first bought oak casks, some of which are still visible at the winery to this day. Louise, tellingly nicknamed l’intrepide (or the “intrepid one”) must have been a forward thinking lady; as enterprising women were frowned upon during this time. Not surprisingly, the estate took her husband’s name. Today the winery is run by Etienne Sipp, who took over in 1996 and now owns about sixty hectares of vines. Sipp also buys grapes from growers with whom the family has longstanding running collaborative agreements. Sipp has farmed his own vineyards organically since 2005 and gained Ecocert certification in 2008. 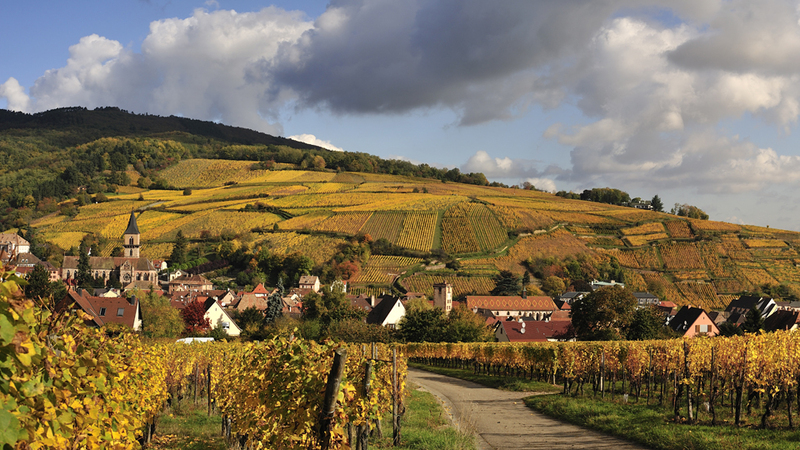 The Louis Sipp winery is located in the heart of Ribeauvillé, one of Alsace’s most famous and prettiest towns. The vineyards are blessed with complex geology and soils that are characterized by varying amounts of limestone, clay and marl, with pockets of loam and sandstone. Ribeauvillé is also characterized by a dry (only about 550-650mm of water a year) and relatively cool climate thanks to the presence of katabatic winds (from the Greek word katabaino , or “to go down”; therefore, the term “katabatic” refers to downslope winds flowing from higher elevations to the valleys or plains below). Also, Ribeauvillé sits at the exit of a long valley, which acts as a funneling agent for the winds. This topographical feature further increases the effect of the naturally occurring winds. The cool microclimate helps preserve acidity in the grapes, increases diurnal temperature variations and lengthens the time between flowering and harvest, which means the grapes enjoy long hang time. This combination of factors results in wines of complexity and noteworthy aromatic expression. 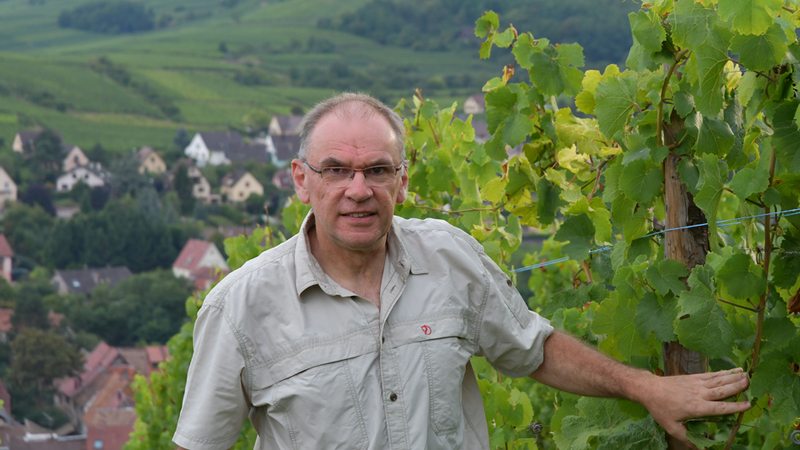 Louis Sipp makes wines from two grand crus; Kirchberg de Ribeauvillé and Osterberg. Not to be confused with the similarly named Kirchberg de Barr (the Kirchberg cru that is associated with the town of Barr), the Kirchberg de Ribeauvillé is much smaller (the latter is roughly 11.5 hectares large compared to the former’s 40 hectares). Kirchberg de Ribeauvillé has long enjoyed a very good reputation. Its existence was first documented in 1328 and the name was long used as a lieu-dit on labels long before Alsace’s Grand Crus were officially determined. The site has a mainly south, south-west facing exposure. The vineyard starts steep, then flattens somewhat as it climbs upwards from about 270 to 350 meters above sea level. The site has always been associated with firm, powerful, long-lived Rieslings (the Muscat varieties have always performed well too.) Louis Sipp has always been one of the best, if not the best producer, of Kirchberg de Ribeauvillé Riesling. The estate’s Kirchberg vines are tightly spaced (up to 8300 vines/ha) and are approximately forty years old. The vineyards are located in two main parcels; one situated on the fully south-exposed steep lower part of the slope and the other in the historic center of the Grand Cru. The mainly marly-clay and sandstone soil and cool microclimate combine to give very austere Rieslings characterized by bright, almost piercing acidity when young, but Kirchberg wines also have a broad, large mouthfeel and a powerful spine. Rieslings from this site often exhibit spicy and mentholated character. If and when grapes are hit by noble rot, then the wines develop a creamier, fatter mouthfeel. Generally speaking, I find the Kirchberg Rieslings to develop slowly in the bottle. Louis Sipp’s wines are especially age-worthy. In my experience the wines need about eight to ten years for their mineral and fruity components to emerge fully. 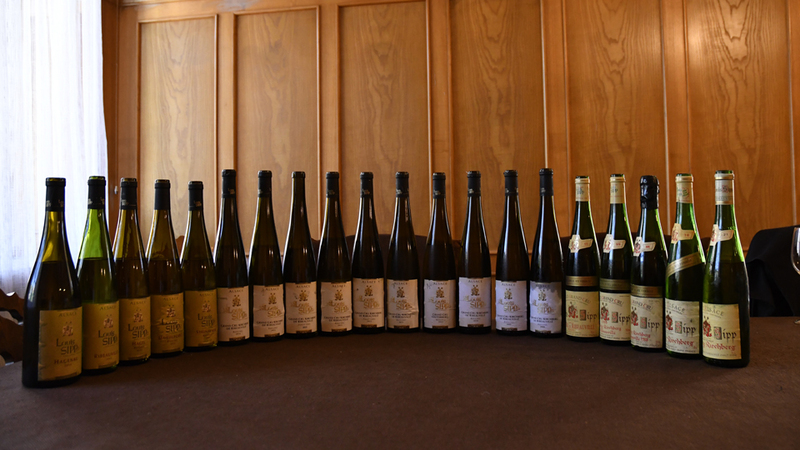 Sipp ages his Kirchberg Riesling in large, used oak barrels, and leaves them anywhere from eight to twelve months on the lees depending on the vintage, which further adds to the wines’ complexity. In 2004, Sipp changed the estate’s labels, providing consumers with information by way of simple graphic aids. For example, the Kirchberg label has a plunging diagonal line running from left to right indicating the slope’s steep gradient, the sun is depicted in an off-center position in the bottom half of the label (meaning this is a site that has a mainly south-west exposure) and the soil type of loosely-textured stony marly-clay-sandstone is shown in two small rectangles at the very top and bottom of the label. All the following wines were sourced directly at the winery and were tasted in Ribeauvillé last September 2016.